Marine aerosol and its chemical processing has a significant impact on the global radiation budget and therefore on climate. Halogen species, i.e. chlorine, bromine and iodine compounds, are of particular importance in marine environments. 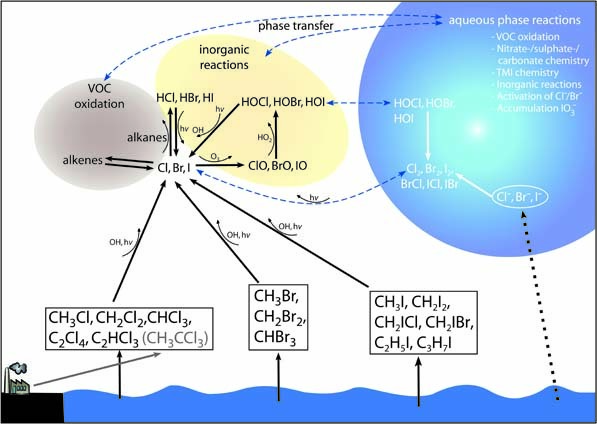 The activation of chloride and bromide within sea-salt particles emitted from the ocean's surface forms the largest source for reactive halogen compounds in both, the gas and the aqueous phase. Direct emissions of alkyl halides from the ocean or, in coastal regions, from macroalgae during low tide form an additional source of halogens in the troposphere. Their photolysis or oxidation by radicals such as OH or NO3 leads to halogen atoms, which take part in several multiphase reaction cycles, where further halide ions in particles are activated, ozone is destroyed, or the tropospheric oxidation capacity is influenced. 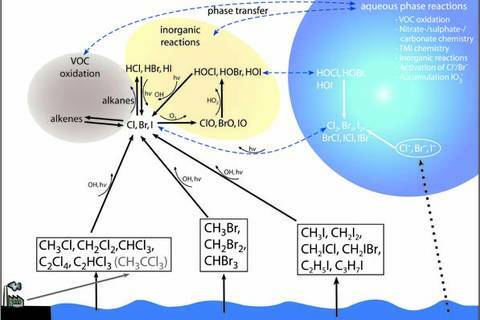 To better understand the complex multiphase processes and their influence on environmental key issues such as air quality or climate change, sophisticated multiphase mechanisms for the description of the tropospheric halogen chemistry have been developed at the TROPOS. The Halogen Module 2.0 (HM2; Bräuer et al., 2013) is a mechanism especially designed for marine environments. 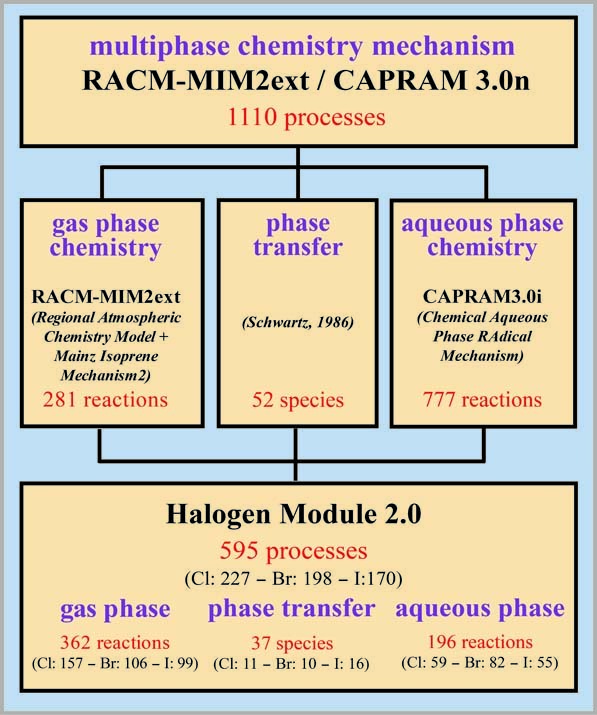 The modular use together with the multiphase mechanism RACM-MIM2ext/CARPAM 3.0n (Tilgner und Herrmann, 2010; Bräuer et al., 2013) makes it a comprehensive mechanism with about 600 reactions concerning halogen chemistry in the gas and the aqueous phase (see Fig. 1). The HM2 is the update of the Halogen Module 1.0 (Herrmann et al., 2003) and can be adopted for various scenarios in every geographic region reaching from pristine regions of the open ocean to coastal areas, where polluted air masses mix with marine air masses. A simplified schematic of the processes implemented in the HM2 is given in Figure 2. 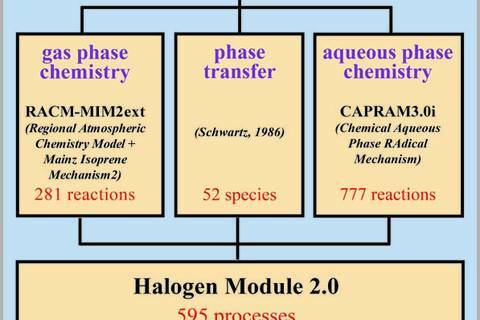 The HM2 was used for detailed process studies with the box model SPACCIM (SPectral Aerosol Cloud Chemistry Interaction Model; Wolke et al., 2005) with a focus on the different halogen multiphase reaction cycles, the halogen induced ozone destruction, and interactions with other subsystems such as NOx or organic compounds in the gas and the aqueous phase or the aqueous phase sulphur(IV) to sulphur(VI) conversion (Bräuer et al., 2013). More recent investigations focus on regimes in coastal areas with mixed urban and marine air masses (see poster gallery of the chemistry dept.). The studies are of global importance as about one half of the earth's population lives in coastal areas and about 3/4 of the megacities with more than 10 million people are situated here. Herrmann, H., Majdik, Z., Ervens, B., Weise, D.: Halogen production from aqueous tropospheric particles. Chemosphere 52(2), 485–502, 2003. Bräuer, P., Tilgner, A., Wolke, R., and Herrmann, H.: Mechanism development and modelling of tropospheric multiphase halogen chemistry: The CAPRAM Halogen Module 2.0 (HM2), J. Atmos. Chem., 1-34, DOI: 10.1007/s10874-013-9249-6, 2013.